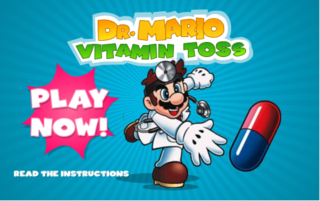 Dr. Mario: Vitamin Toss is a simple mini-game produced by Nintendo in which you throw vitamins into colored bottles in a surprisingly successful attempt at destroying the man sized viruses that are in your hospital. Bizarrely, this game includes two placeholder images containing the words "jet lag" and "jet lag 2". Exactly why they are in this game is a mystery for the ages. This page was last modified on 6 May 2018, at 20:51.